This 25ft Towered Bertram out of Carillo, Samara and Guanamar is powered by a Yanmar 240hp Diesel. 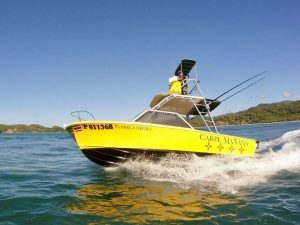 Experienced American Captain Fred Maschmeier, who has fished Costa Rica for over 25 years, first at Quepos and Drake Bay, and now in Carillo, is at the helm. It has a head, lots of shade, outriggers, live well, tuna tube, Furuno fish and depth sounder, Furuno GPS, stereo, and a wide selection of mostly Shimano reels and rods, trolling and casting rods and reels, along with a varied assortment of trolling lures and teasers. The boat also carries the complete range of required safety gear. Baits, ballyhoo, and live bait (sometimes even on half days) are included. The full day includes fruit, snacks, a good lunch with sandwiches made on the boat, pasta salad, bottled water, soft drinks and beer. The half day includes refreshments, fruit and snacks.